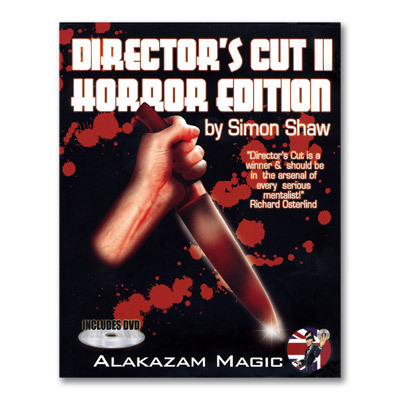 Director's Cut Horror Edition is a new set of post cards for Simon Shaw's hugely successful Director's Cut trick. This new version includes all of your favorite effects from the original, along with many additional twisted plots, ideas and routines that are simply to die for! Director's Cut Horror Edition comes complete with horror movie poster cards (the same high quality stock as the original version), a few surprise bonus cards and a new DVD with some great new effects! Whether you already own Directors Cut or are looking for something new for your magic/mentalism act, we think you'll enjoy the Horror Edition!